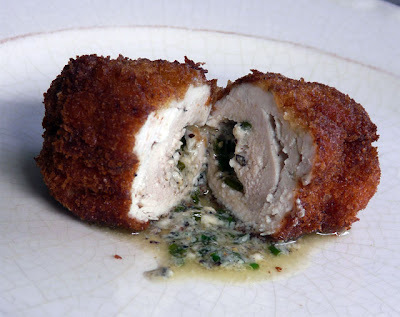 Dinner tonight was Chicken Kiev with a blue cheese and chive butter rather than the more traditional parsley and tarragon butter. It didn't take very long to prepare. I already had the butter made. It was leftover from the steak dinner we had a few days ago. No real recipe - just an outline. Mix herbs into butter, place on plastic wrap and roll into a cylinder. Refrigerate. Pound out boneless chicken breasts, place a piece of butter on the chicken fold the sides over and then roll up. Use toothpicks to hold together. Dip into seasoned flour, into beaten egg and then into fresh bread crumbs. Heat oil to 350°F. Fry chicken until golden brown. Approximate 10 minutes. Ann, your Chicken Kiev looks great! It's been so long since I've had it - now I'll have to make it soon. Love that you used a previously made compound butter! Looks delicious! Oh it looks scrumptious! Absolutely mouth watering. I may try it this week as a matter of fact. 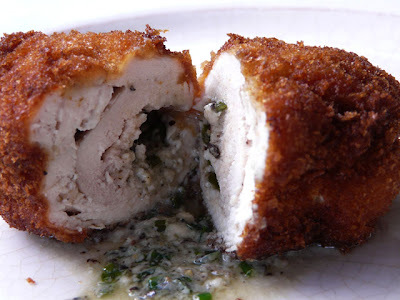 I have never made Chicken Kiev. It looks amazing! I love your substitution of the the chives and blue cheese. I am not a big tarragon fan for some reason. Thanks for sharing this recipe! My kids would go wild for your version Ann...as always everything looks wonderful! Thank you. Seriously, thank you. I have an overabundance of fresh chives and tarragon in my herb garden and I'm looking for more inspiration. I just found it. My mouth is drooling. I need to ask hubby to thaw out the chicken breasts in the freezer. Hurry up, clock! Your rolls look so perfect! How do you do that?! 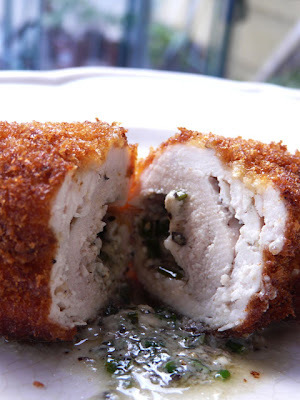 The chicken Kiev just looks so very good! I am starving for them. This looks so moist and delicious, I love the sound of that chive butter -- yum!